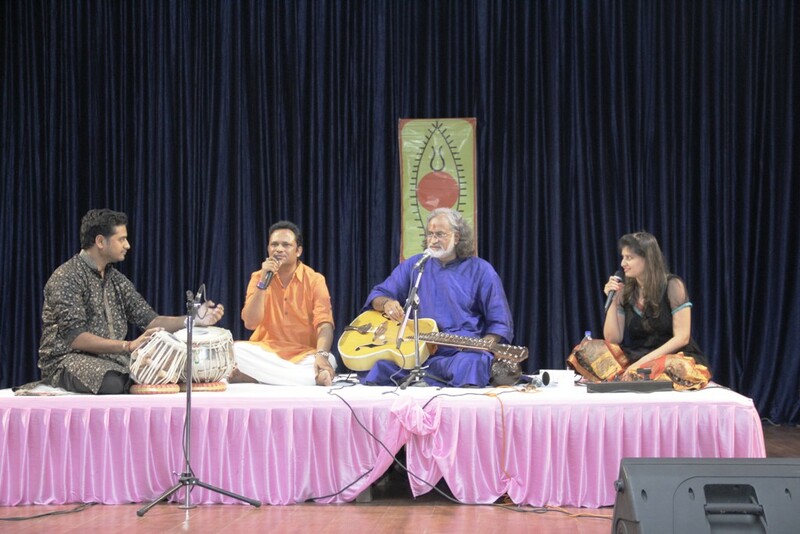 On the evening of 4th Sept,2014 the auditorium of Career Point university get echoed with the lavishness of Indian Classical and Music performed by maestro artist and the Grammy Award Winner Pandit Vishwa Mohan Bhatt and Mr.Prathvi Raj Mishra. He is known for his ability to spell bound the audience with his supernatural powers in the field of Classical Music.Proving the essence o his name Mr. Vishwa Mohan bhatt ,vishwa (means world ) and mohan(means charm). “The world charmer”, is the creator of Mohan Veena ,the combination of Hawaiin and Guitar with perfect assimilation of Sitar,Sarod ,Veena techniques and by adding 14 more strings . Being the power house performer , Pandit Vishwa’s electrifying performance always captivate the audience whether its in USA or in his mother land .It is said when an artist performs on stage 15% is already a composed music and the rest 85% is created on the stage . By talent virtuosity and creativity of the musician the seven notes of music are elaborated and music is decorated with the imagination color mood and expression. He not only perform the classical art but also involving the audience with him. He said “A music is sacred divine, meditative, purification and provoke emotion of love which is not only meant for entertainment ,it is to take you to the trans state where you merge as one with the God. Those 60 min of Classical music enrich the audience with an emotion of veneration and wonder that can truly be inspired by an experienced artist. It was a sight that filled audience with awe and reverence.